On July 1st, 1995, Dark Horse launched an exciting comic book series set in the Star Wars Expanded Universe. Over the next fifteen years, 41 comic book issues and eleven novels were released that share not only characters and setting, but a distinguished namesake: the X-wing starfighter. The X-wing series remain some of the most lauded and successful tie-in stories in the history of the Star Wars Saga, and they will form the core of this 21-part reread series. Now known as the “Legacy Canon,” the Expanded Universe focused not only on the adventures of Han Solo, Princess Leia, and Luke Skywalker, but on dozens of minor characters from the Classic Trilogy–and hundreds of entirely new ones. Though there other, earlier projects that fleshed out the world of the Star Wars films–such as Alan Dean Foster's 1978 novel Splinter of the Mind's Eye, and the original 1977 Marvel-licensed Star Wars comics series–the contiguous Expanded Universe truly began in 1991 with the publication of Heir to the Empire by Timothy Zahn. Throughout the rest of the 1990s (until the release of the prequel film Star Wars Episode I: The Phantom Menace in 1999) the principle setting of Star Wars tie-in fiction was in the decades following the events of the original trilogy. While Greedo was inexplicably shooting first, heroes and villains, old and new, were embarking on new adventures all the time offscreen. Zahn and many others were developing a broad family of interconnected storylines and characters that have appeared in scores of tales across all forms of media. The X-wing series of comic books and novels was a keystone component of the Star Wars franchise in the 1990s. The series centers on a group of characters who are mostly pilots, with intelligence agents, diplomats, politicians, support personnel and myriad civilians rounding out the dramatis personae. These pilots–our heroes–are members of an elite military unit called Rogue Squadron. Rogue Squadron is a key fixture of the Expanded Universe, having originated in Star Wars Episode V: The Empire Strikes Back. In Empire, Luke Skywalker led the group against the giant Imperial walkers on the ice planet Hoth during the battle in the first act of the film. The Rebel Alliance–and the New Republic which succeeded it–depended heavily upon the services of its pilots and other personnel during the Civil War against the Galactic Empire. The members of Rogue Squadron were famous for many dramatic exploits, and perhaps most of all for their use of one of the finest (fictional) military machines ever created: the X-wing Starfighter, also known by its model number, "T-65." After the Millennium Falcon and the Star Destroyer, the T-65 X-wing is perhaps the most iconic spacecraft depicted in all Star Wars media. In the past four decades, it has had video games, comics & books named after it, and countless toys made in its likeness. Images of what would become the X-wing first appeared in November 1975 in concept art created by Ralph McQuarrie, based on concepts by effects artist Joe Johnston. (An extensive and fascinating gallery of McQuarrie's Star Wars work can be found here, and additional images from the other two Classic Trilogy films here.) 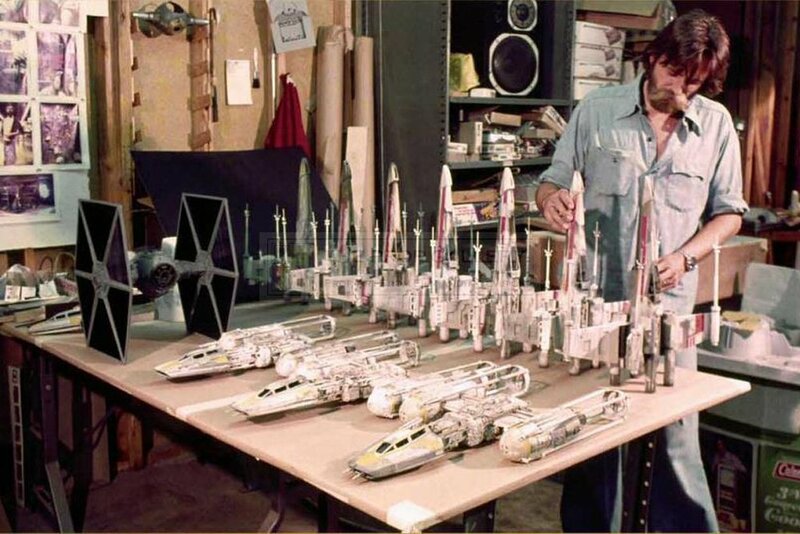 Model construction was completed at Industrial Light and Magic (ILM) during pre-production for Star Wars in 1976 by Johnston and visual effects designer Colin Cantwell. The powerful and enduring image of the X-wing is due mostly to the Death Star battle sequence, which was shot to resemble World War II film reels of airplanes dogfighting over Europe and the Pacific, and masterfully edited by Marcia Lucas, for which she won the Academy Award. The Incom T-65 series starfighter, also known as the "X-wing" after the distinctive "X" shape its stabilizer foils form while in combat, was designed to be a Space Superiority craft. Rather than a dedicated bomber, scout, or interceptor type, the X-wing was designed to dominate its environment. The basic T-65 variant is armed with four laser cannons and a pair of proton torpedo launchers carrying a magazine of six torpedoes total. Unlike its Imperial counterparts, the X-wing has shields and a hyperdrive system, which allows it to travel to and from battle unaided by a carrier. The standard configuration called for a single humanoid pilot, supported by an Astromech droid to handle navigation and assist with managing ship systems and onboard repairs. ABOVE: Star Wars: The Essential Guide to Vehicles and Vessels (1996) written by Bill Smith–with artwork by Doug Chiang and Troy Vigil–was one in a series of technical manuals that helped round out the novels, comics and games of the Expanded Universe. LEFT: X-wing being serviced in Yavin hangar; X-Wing in a dogfight with a TIE fighter. The X-wing proved to be the workhorse of the Alliance: it became the premiere strategic starfighter, and was also used for training pilot recruits. It replaced the outdated Koensayr BTL Y-wing, which was slower and less maneuverable by comparison. Later craft like the A-wing and B-wing would be utilized against the Empire as well, but theirs were specialized designs, where the T-65 remained the ultimate generalist. Although it was flown by myriad straighter units throughout the galaxy, there was unit that made more notorious or illustrious use of the X-wing as Rogue Squadron. Rogue Squadron traces its routes back to the original Red Squadron, formed just prior to the assault on the first Death Star. Red Squadron was temporary outfit, cobbled together with new recruits and the remnants of other units after the evacuation of Dantooine. The Battle of Yavin was devastating to the Alliance's forces: all twelve of Red Squadron's X-wings were damaged or destroyed outright, and nearly every pilot spent their lives against the titanic battle station. Gold Squadron, the Y-wing bomber group, fared even worse, making the survival of the handful of pilots that made it back an instant legend. Clone Wars veteran Garven Dreis (Drewe Henley), the first Red Leader, Wedge Antilles (Denis Lawson) flew as Red Two, Biggs Darklighter (Garrick Hagon) was Red Three, rookie pilot Luke Skywalker (Mark Hamill) was assigned Red Five, with seasoned flier Jek Porkins (William Hootkins) at Red Six. It was Luke Skywalker's torpedo volley that triggered the chain reaction which destroyed the moon-sized battle station. Red Squadron's victory at the Battle of Yavin ensured the survival of the leadership of the Alliance to Restore the Republic, and made them the most celebrated starfighter unit of the Galactic Civil War. Under the command of Luke Skywalker, the X-wing unit that had been Red Squadron was expanded to include spacecraft and personnel of all types: warriors capable of achieving victory in any situation no matter the odds. Rogue Group–as it was then called–flew T-47 Snowspeeders at the Battle of Hoth to cover the escape of thousands of Alliance personnel after the base was discovered by Darth Vader. As the Imperial forces landed, the Rogues fought a desperate holding action–massively outgunned, they still managed to take down a handful of All-Terrain Armored Transports, buying precious time. "Go for the legs, it might be our only chance of stopping them!" A larger number of pilots survived the against the Imperial AT-AT walkers than had against the Death Star. Wedge Antilles, flying as Rogue Three, and his gunner, Wes Janson (Ian Liston) were the first to harpoon one of the towering transports and bring it down. Derek “Hobbie” Klivian (Richard Oldfield) used the callsign Rogue Four as Luke's wingman and one of his most trusted lieutenants. Both Hobbie and Janson went on to help lead the squadron in subsequent action against the Empire. Not all of the Rogues were so fortunate. Despite being one of the most experienced pilots flying at Hoth, Rogue Two, Zev Senesca (Christopher Malcolm), was shot down over the frozen plain. Luke's own gunner Dak Ralter (John Morton) was also among those that died protecting the base. Dak was a new recruit, on one of his first missions with the Alliance. "Cable out – let 'er go!" "Two fighters against a Star Destroyer?!" "I found them. Repeat: I found them." Following the defeat at Hoth, Commander Skywalker left the military to pursue his Jedi training, and command of the Rogues fell to Wedge Antilles. A naturally gifted pilot from Corellia, Wedge would lead the squadron for over a decade. His first major test was the at the Battle of Endor. As Red Leader, he led the Rogues and many other pilots alongside General Lando Calrissian against the Emperor's second Death Star, and destroyed it. Lando's Sullustan copilot in the Millennium Falcon was Nien Nunb, whose sister, Aril, flew with the Rogues a few years later. Captain Antilles became the only pilot to survive both Death Star runs, and this distinction earned him a unique celebrity within the Alliance. After the defeat of the Empire at Endor, Rogue Squadron was reorganized again as a purely X-wing unit. They became the tip of the spear in the Alliance's quest to root out the remaining Imperial forces and restore freedom to the galaxy. "I'm already on my way out." Shortly after the Battle of Endor, the Rebel Alliance reformed itself into the New Republic, offering stability to systems and peoples who now found themselves subjected to chaoe, uncertainty, and petty warlords. It is in this setting that the X-wing: Rogue Squadron comic book series begins. There are 41 comic book issues and eleven novels that will be part of this reread series. They are organized for this project in the order of in-universe chronology–not in the order of publication. Parts 1–9 of this project chronicle the events just after Return of the Jedi. Part 10 is a collection of comic issues that connect to the main sequences of events more tangentially. The novels of Parts 11-21 cover approximately seven years of continuity in detail; the final book depicts events that take place decades later. To supplement and summarize the characters, ships, locations, and events of the comics, the Rogue Squadron Handbook was created in 1995. There are two "special" issues that were released under the X-wing imprint in 1997 & 1998. Though the share broader continuity with the rest of the Star Wars Expanded Universe, they are not part of the specific storylines explored in the rest of the series. There is also a three-issue series called "Rogue Leader" published much later than the rest (in 2012) that also follows the adventures of some of the members of the squadron. Examination of these various issues will serve as the transition point from the comics into the novels in our reread series. While technically not a part of the X-wing series, per se, this novel features many stars of the novels & comics, and continues their stories therein, making it a natural addition to this reread series. Rogue Squadron pilot Corran Horn is the principle protagonist of this novel (as he was in Stackpole's X-Wing novels) which was the first Star Wars book to be written in the first person. While revealing the main conflict of this story would constitute a bit of a spoiler for the stories that come before it, it's safe to reveal that Corran is assisted by none other than Jedi Master Luke Skywalker, and many of their friends in the New Republic armed forces. The novel's main antagonist is Leonia Tavira, continuing her storyline from the X-Wing comics series. I'm Already On My Way Out: Rogue pilots doing things that ought to be impossible, following in the footsteps of their fearless Corellian leader. While ordinary Rebel pilots were expected to keep up kill ratios of 3:1 against TIE Fighters, expectations for members of Rogue Squadrons are a bit higher. Can you and your wingmate destroy six TIE Interceptors in a head-to-head pass without getting singed? Can you board and capture a light cruiser with just a blaster and a smile? Do you know how to coordinate proton torpedo fire to drive off an Interdictor Cruiser? You might make a good Rogue. The Imperial Perspective: We'll devote a bit of time to the members of the disintegrating New Order regime(s), as they struggle to maintain some semblance of their old position. The comics series and novels each have some fairly sympathetic Imperial characters, as well as their fair share of sociopaths and genuine evil." Many under Imperial rule were only victims of circumstance, and the Alliance military was populated with more than a few deserters and turncoats. Regime Change: While pilots typically paint silhouettes of their kills on the sides of their fighters, they don't typically keep track of their political victories in the same fashion. We'll correct that error, with this running tally of toppled governments. All Wings Report In: We'll review the roster of current squadron personnel at the conclusion of each storyline, and note any changes (there will always be changes–Rogue Squadron gets assigned the most dangerous missions, and thereby has an unusually high turnover rate.) We'll haze the new rookies and take moments of silence for fallen comrades. Diversity Statement: In the original films, the Empire is depicted as being composed of officers who are all human, and all male. The X-wing series (among other stories published around the same time) codified the institutionalized chauvinism within the Imperial forces, instigated and maintained by the Emperor himself. Palpatine is depicted much like Adolf Hitler or Joseph Stalin, purging the upper ranks of government at all levels–local, planetary, & galactic–and replacing the vacated offices with loyal (human) men. This prejudice was one of the Alliance's principle arguments against the Empire to subjugated systems: the Empire was inherently morally corrupt because of its lack of diversity. The Rebels, meanwhile, prized diversity and drew strength from integrating various skill sets within the larger whole. (Side note: while apparently condoned under the Old Republic, sentient slavery widespread under the Galactic Empire, and was yet another argument in favor of the Emperor's dethronement by the Alliance. Both Chewbacca and Ackbar were Imperial slaves before being liberated and taking up arms agains the Empire.) Neither Stackpole, nor Allston–nor many other EU authors, canonical or otherwise–were ever shy about creating new species from new worlds, with strange and interesting new characteristics. This category is designed for us to take special enjoyment of their efforts. The 1990s were a boom time in Star Wars tie-in materials, with dozens of video games, novels, short stories, and comics books being written to tell further adventures of the characters from the original films and beyond. After the phenomenal success of Heir to the Empire, what would be referred to in twenty-first century parlance as a "shared universe" of people and locales was born. The X-Wing comics series and novels series were instrumental blocks in the foundation of this dynamic. The two authors principally responsible for the creation of the X-wing adventures were Michael A. Stackpole and Aaron Allston. “In preparing to do a series of books, most authors put together a lot of background on their characters. I’d done that for the X- wing books, so when Dark Horse approached me about working on the comic, I saw the comic stories as a great place to actually make use of some of that material. The comic stories, then, provide background information on and details about some of the earlier adventures of the members of Rogue Squadron. While he only wrote a handful of the volumes in this series, Aaron Allston penned thirteen Star Wars novels in total (in addition to many other novels and a successful career as a game designer & magazine editor.) Allston's X-wing novels are known not just for their action, but especially for their humor. His books are among some of the most outright comedies of the '90s-era EU. In a 2011 interview with Random House's Suvudu site, Allston provided some additional details about his involvement with the X-wing series. After Stackpole completed the first 4-book X-wing arc, the publisher wanted to commission him to write an additional four. He was unable to do more than one on the schedule they required, so he recommended a long-time friend and collaborator, Aaron Allston, to fill in the remaining three slots in the publishing calendar. During this same interview, Allston revealed that the "scope of the Star Wars universe can be very intimidating," and that "Wes Janson was, hands down, the most fun" character to write.